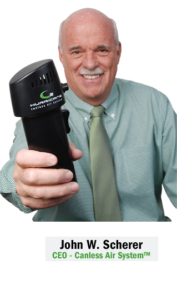 In 2011, John W. Scherer ventured into a new product launch – Canless Air, a necessity for any computer user, technician or anyone looking for an environmentally-safe alternative to canned air. His company, Canless Air Systems, has been mentioned on ABC, Gizmodo, the Denver Business Journal, The Wall Street Journal and many other media outlets. Even The Wharton School of Business IT Department uses and recommends the Canless Air System. Canless Air System aims to eliminate the need for canned air, while at the same time has created one of the best all time cleaning products ever invented! For both home and business use, Canless Air is great for cleaning computers, book shelf’s, workshops, window blinds, car dashboards, tools and anywhere that dust accumulates. In four to five hours, the Canless Air O2 Hurricane is fully charged and can blow over 220 miles per hour for up to 15 minutes per charge. It just uses the air we breathe. The O2 Hurricane is also rechargeable up to 1000 times. The Canless Air O2 Hurricane is completely non-toxic with no health hazards or dangers of exploding. The 02 Hurricane has a Special Edition unit that John developed in September of 2013. The Special Edition is primarily for the consumer around the home and comes with a 6 month warranty. John recommends you go to the videos section of our site to see uses for around the house.